Magazine illustration of mining on the Sacramento River. Image courtesy of the Bancroft Library. Here the sun’s rays come blistering down the deep and narrow gorge where seats together all the nations of the earth. . . . There’s nothing here to please the eye or gladden the heart but Gold. The Yankee, the Mexican, the Spaniard, Portuguese, Chinese, Malays, N. Zealanders, Sandwich Islands, Chillanians, Peruvians, besides various Tribes of Indians tame and wild, civilized and barbarous. I have seen that I know of at this moment. These with some other nations are all toiling after this wondrous stuff. 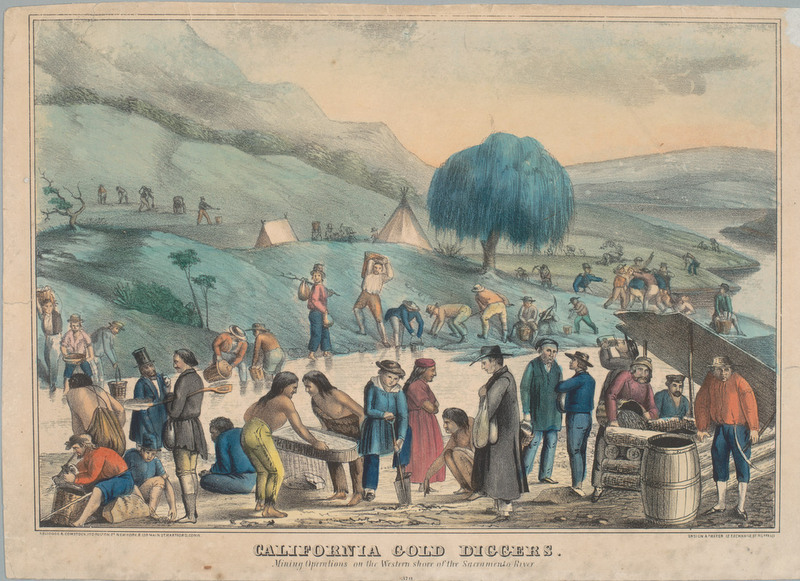 Men (and a few women) had flocked to the goldfields from around the world, and any ship that docked in San Francisco after word of the gold discovery got out was soon deserted of all its sailors, no matter where they were from. Almost the only group John Bidwell doesn’t mention are African-Americans, but they were there too, and he would have met them. Some were brought as slaves by their Southern masters, and many came as free blacks to try their luck in the goldfields. 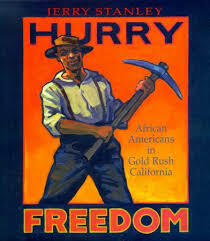 For a look at the African-American experience in California, an excellent book is Hurry Freedom, by Jerry Stanley. Although written for younger readers (like my own book), it is a good overview for any reader. It focuses on the experience of Mifflin Gibbs (1823-1915) born in Pennsylvania, who had a successful boot store in San Francisco and founded the city’s first black newspaper. Gibbs led the black community in an unsuccessful struggle to get the California legislature to recognize equal rights for African-Americans. Gibbs finally gave up and migrated to Canada during the Fraser River gold rush. After the Civil War he returned to the United States, studied law, and served as a judge and as U.S. consul to Madagascar.